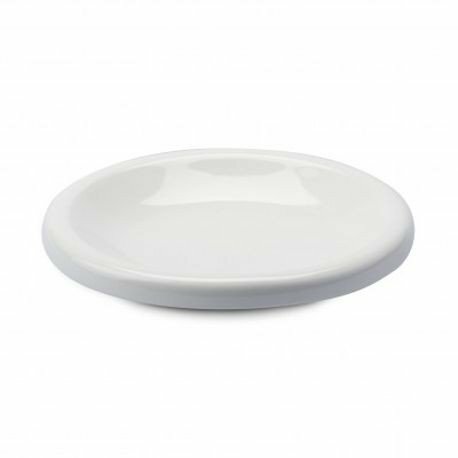 Figgjos 7-2/3 Aura Plate is a highly versatile coupe that subtly combines functionality and elegance. The simplicity of Auras plating surface, perfectly flat at the center then gently sloping toward a rounded edge, belies meticulous design that creates the illusion of a plate floating above the tabletop. This is truly elevated dining that adds a ritual scene to the eating experience. Aura is available in two sizes, both seamlessly stackable. Figgjo is a Norwegian dinnerware factory that specializes in culinary grade porcelain. 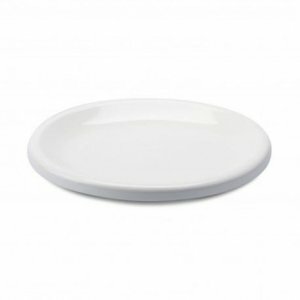 Their optic white china body and award-winning design are sure to elevate any presentation. We also love their commitment to sustainable practices. Everything from design to R&D to manufacturing to glazing to photographing to printing, and then some, is done in-house, reducing lead times, logistics, and waste. In fact, Figgjo has ZERO emissions to the external environment  everything that can be is recycled!